Cupron, Inc. is a copper-based antimicrobial technology company that harnesses the unique properties of copper for healthcare, consumer, industrial, and military applications. Cupron embeds specified copper compounds in select polymers that enable finished products to deliver the desired impact. Unlike topically-applied solutions, Cupron’s durable embedded copper technology does not wash or rub off. Cupron’s patented and proprietary embedded copper technology has earned multiple, unique public health claims from the US Environmental Protection Agency (EPA), and additional innovations are in development. R&D. Cupron scientists spent years determining the most appropriate compounds, particle size, surface area, ion release rates, and behavior within polymers that would best achieve the desired effects. In the first field test of Cupron’s technology, the famed Chilean miners trapped in the Copiapó mine were provided with prototypes of Cupron’s antifungal socks. Cupron licensed technology to EOS Surfaces of Norfolk, Virginia, and began joint development of copper impregnated antimicrobial hard surfaces. Cupron Enhanced EOS Solid Surfaces registered with the EPA to kill 99.9% of bacteria in under two hours, a unique registration for an antimicrobial polymeric surface. Cupron’s technology in a fiber and fabric received the first and only EPA public health claim for specific anti-fungal protection, namely to kill athlete’s foot fungus on that fabric. The first trial of Cupron Medical Textiles was conducted at Reuth Hospital in Tel Aviv, Israel. 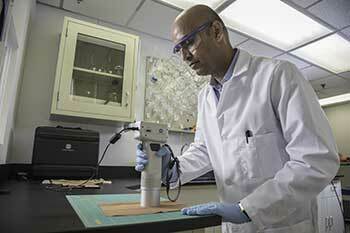 With partner EOS Surfaces, received VA Governor’s Award for Science and Innovation. Awarded Anti Jock Itch Claim from the EPA. Sentara Healthcare trial of Cupron Medical Textiles and Cupron-Enhanced EOS Surfaces began at Sentara Leigh Hospital. Cupron Medical Textiles deployed at Sentara CarePlex Hospital. Expanded deployment of Cupron Medical Textiles and Cupron Enhanced EOS overbed tables and bed rails to Sentara Norfolk General Hospital, Sentara Virginia Beach Hospital, Sentara Princess Anne Hospital. Herzog Hospital study conducted (2nd trial of Cupron Medical Textiles alone). In the first trial of its kind, Cupron’s textiles were assessed in a double blind placebo led cross over trial. Awarded Anti-Odor Claim from the EPA. Kimberly-Clark launched Cupron Enhanced Adult Diapers across institutional and retail channels in Israel. Sentara announced results of Sentara Leigh Hospital trial involving Cupron Medical Textiles and Cupron Enhanced EOS Surfaces. In 2016 Netafim introduced a revolutionary new dripperline using Cupron technology to provide superior root intrusion resistance. Sentara Leigh Hospital Trial Results published as a Major Article in AJIC, October. Herzog Study Results Published in AJIC, December. In late 2016 Cupron moved from the Richmond Biotech Center to our own facility near Richmond International Airport. The new facility has over 3,000 square feet of office space, 11,000 square feet of warehouse space, and our own state-of-the-art textile engineering and microbiology lab – optimal for our current growth phase. Sentara expanded deployment of Cupron Medical Textiles and Cupron Enhanced EOS overbed tray tables and bed rails to all 12 hospitals. Under Armour debuted Boxer Jock with Cupron technology.